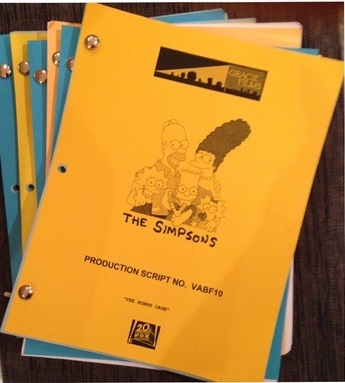 ← 590 "The Marge-ian Chronicles"
Homer sends a message with emoji of him, Marge, Bart, Lisa, Maggie and the couch, and recieves in answer "Meh" "I don't get it" "Needs a payoff" "Created by Matt Groening", to which he says "Oh, sorry, yes sir", and "Developed by James L. Brooks Matt Groening Sam Simon", to which he says "Who are this guys? ", and the reciever sends "Meh" again. A Villanova Wildcats men's basketball team member, with the number 18, jumps over the title screen and scores. "The Burns Cage" is the 17th episode of season 27 and it aired on April 3, 2016. 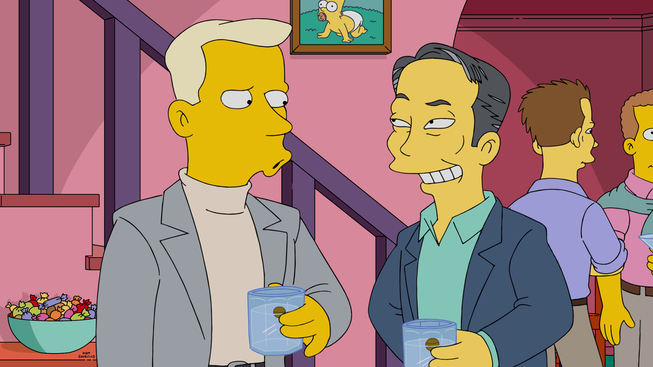 "When Smithers is devastated by Burns' lack of affection towards him, Homer makes it his mission to find him a boyfriend. Meanwhile, after Bart orchestrates the removal of the lead in the school's stage production of Casablanca, Milhouse serves as a terrible understudy, which frustrates his co-star, Lisa." 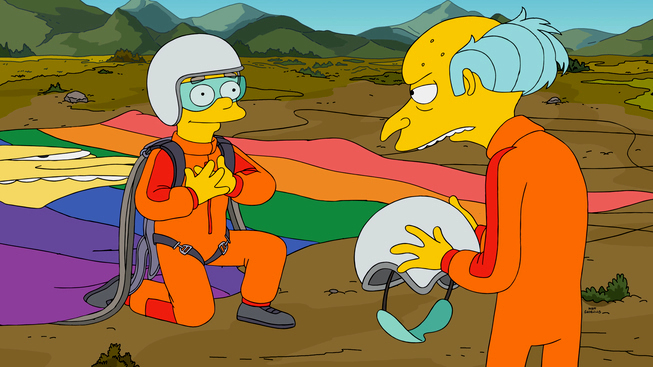 Smithers and Mr. Burns go skydiving together, but Burns blacked out and slip through his parachute, so Smithers jumped after him, managing to catch Burns during freefall and save him. When they reach the ground, Smithers decides to proclaim his love to Mr. Burns, but he's ignored. Broken-hearted, Smithers decides to supervise the work from the Plant's employees: Homer, Carl and Lenny. They all realized what was going on, so Homer decided to find a new soulmate to Smithers so he would not be angry at work. Homer decided to invite all gay men from a dating app, Grinder, to a party where Smithers could pick his new love, but he got very annoyed and decided to just take a drink and leave. At this moment, he meet Julio, and they fall in love with each other. Smithers quits his job at the nuclear plant and decides to move to Julio's homeland: Cuba. With Smithers out, Burns tried to find a new replacement for him, but everyone he tried failed miserably. But things weren't going well in Cuba either, as Julio discovers that Smithers haven't got over Mr. Burns yet. They break up and Smithers travels back to Springfield, where he and Burns reconcile at a romantic dinner. On a secondary plot, the Springfield Elementary School was making a Casablanca play. 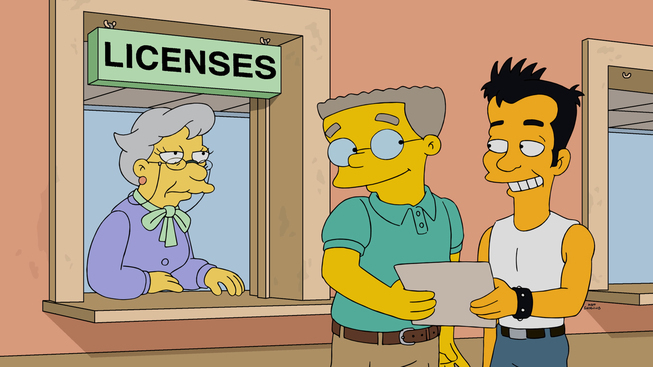 As Lisa manages to get the role of Ilsa, Milhouse auditions to the role of Rick so he and Lisa could be the play's main couple. However, a new kid named Jack gets the main role. As only him and Milhouse auditioned for that character, Bart decides to take him out of the play by getting Dolph, Jimbo and Kearney to beat him, but their plan backfires as Jack defeated them. However, Principal Skinner sees Jack beating the bullies and takes him out of the play, giving the main role to Milhouse. Lisa is upset, fearing that Milhouse's lack of talent could ruin the play, but Marge convinced her to support Milhouse so he could do better. At the play, Milhouse gets his lines perfectly, surprising everyone. At the end of the play, however, it's revealed that Jack was playing Milhouse portraying Rick, and he and Lisa go out for a float together. 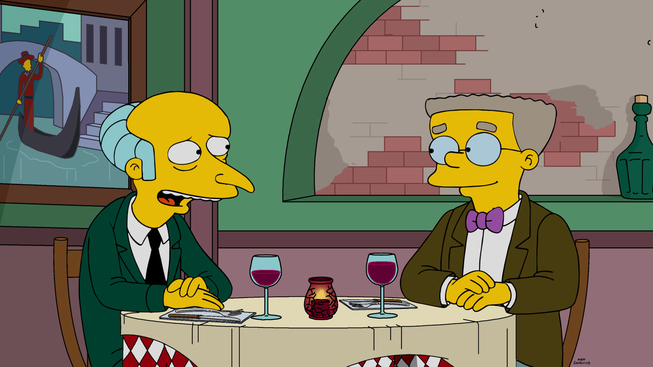 In an interview, Al Jean said that in the episode, Smithers quits his job and falls in love with Julio. ↑ Entertainment Weekly - "Simpsons exec producer Al Jean on Homer and Marge's separation, Smithers' new love, and Spider-Pig's return"
Modified on June 7, 2017, at 06:59.